The new PowerCap™ Lighted cap from Panther Vision™ is the “ultimate hands free torch”!! 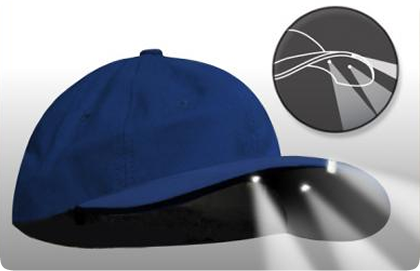 This hat looks just like every other premium quality sports cap -- with one very important difference: When you need light, just click the switch hidden on the underside of the brim and you have instant Ultra Bright light from the LED’s that are built into and under the brim! These LED Lighted Caps use patent pending C.U.B. (Concealed Under Brim) Technology™, which combines 2 LED’s UNDER the brim for up-close tasks and a single Ultra bright LED in the centre of the brim for long distance lighting. This exclusive 3-way lighting technology lets you select the lighting configuration you need for your specific task; Low Beam (2 under brim LED’s) for up-close tasks High Beam (1 Ultra Bright LED in the brim) for distance lighting. Power Beam (all 3 LED’s) when you really want a lot of light. There are so many uses for the PowerCap™ on the job, in and around the house, as well as outdoors that you’ll never want to be without it! Premium, 6-panel hat, premium comfort headband and durable Velcro closure. One Size Fits Most.